Founder Gregg Nichols has more than 20 years experience developing business at the intersection of these three fields - which are some of the hottest in the world today. Based in the southeastern United States, Nichols Knowledge Consulting is a resource that institutional investors, knowledge brokers, and management consultancies can count on when making critical business decisions. 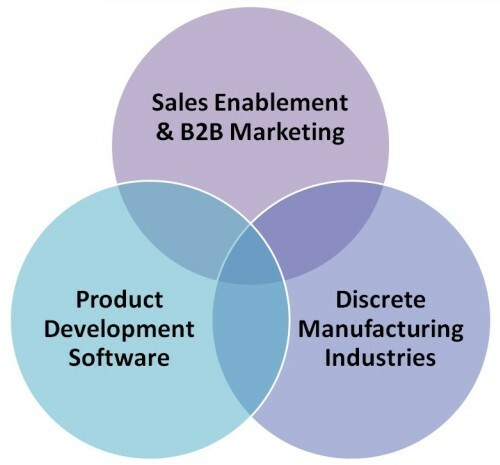 When you aim to identify addressable market opportunities in product development technology for discrete manufacturing customers, Nichols Knowledge Consulting is your first choice, trusted partner. How will your sales force engage for maximum wins, greater deal sizes, and increased follow-on business? Gregg Nichols is a talented sales enablement coach, skilled at building consultative sales organizations. He has created $100M sales enablement frameworks, trained 150 sales professionals, and exceeded 130% annual quota. As both coach and contributor, Mr. Nichols is expert at communicating the tangible value of technology. How will your marketers identify opportunities, target customers, and launch effective lead generation campaigns? An accomplished B2B marketer, Mr. Nichols is adept at analyzing competitive markets, targeting profitable customer segments, and launching effective marketing campaigns. He's managed strategic marketing execution for products and services totaling $500M annual business. Mr. Nichols is accomplished at identifying and capturing market opportunities. How will your software & services create value for customers? Gregg Nichols understands how product development software creates value for business. His accomplishments helping corporate clients focus their technology investments to invigorate product development operations are impressive. Many of his clients realized greater than 100% return, with one achieving a remarkable 1000% gain. How will competition and technology trends impact your offering? The field is undergoing its greatest transformation to date: from desktop to cloud, from purchase to rental, from enterprise to crowd-sourced. Gregg Nichols has worked directly with most of the leading vendors. His knowledge and networks provide keen insight into vendors' product capabilities, market positions, and competitive inclinations. How will you transform the customer's business? Mr. Nichols has extensive experience generating value for manufacturing companies around the world. He led an enterprise software implementation in Australia, managed an application team supporting a $700 million program in England, and spearheaded the European technology migration for a Fortune 10 client. How will you improve the way your customers compete? Gregg Nichols has worked with dozens of customers in discrete manufacturing industries such as Automotive & Transportation, Aerospace & Defense, Industrial Machinery, Medical Devices, Consumer Goods, Semiconductors & Electronics, and more. Mr. Nichols understands the critical value drivers on which each industry competes. He has an aptitude for helping manufacturing companies build winning product development value chains. Our Partners find Nichols Knowledge Consulting insights invaluable when assessing technology investment opportunities for manufacturing customers. View our Services.